Last Saturday was beautiful. Since there have not been too many beautiful days this summer, I took advantage of the sunshine by visiting Hingham Cemetery. After spending nearly an hour on Rte. 3A, I was not expecting the cemetery to be lovely, but it was. I've seen some small-town graveyards that are still in use after 300 years, but Hingham Cemetery is different. The 17th- and 18th-century graveyard has been incorporated into the landscape of the 19th-century rural cemetery to create a beautiful and interesting time-collapsed environment. In this place, gravestones from the 17th century stand just a few steps from graves so new they have not yet grown grass. It was strange, but not unpleasant. The old section of the cemetery is located on a hill behind the Old Ship Church (1681). The oldest surviving gravestone is from 1672, with the bulk of stones dating to the latter half of the 18th century. Many of these gravestones were carved by the Pratt family, whose tiny, bewigged and bonnetted faces always strike me as funny in their exaggerated solemnity. If you visit Hingham Cemetery, don't overlook the 19th-century sections. 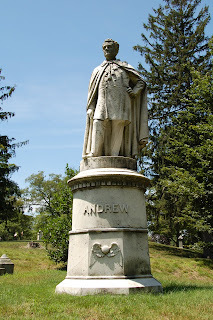 It's no Mount Auburn, but there are some lovely monuments, including the marble statue of Civil War-era governor John Andrew.